It is a rainy, cool day here in Tabuk City, Kalinga and I am having a quiet day at home. I was thinking that some of my blog readers may be interested in knowing a little about what our day-to-day life looks like here in the Philippines. I imagine most of the joys and struggles that families experience are pretty much the same regardless of where we are in the world. However I suppose some things are different. We usually get what we need for our meals every day at the market. We don’t have a big fridge (or ref as it is called here) so we hit the market every day and see what they have. Depending what time of year it is, different fruits and veggies will be available. It is an open market with people calling out to you to buy from them. Some days there will be frogs, eels, bats and maybe even be a cow’s head for sale. I usually skirt by those vendors and choose the chicken, Tilapia or beans. Not very adventurous, I know! 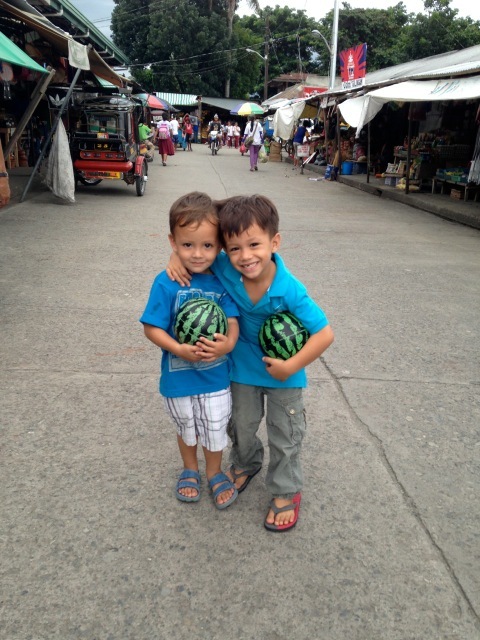 Zion and Lucas at the market. Emmaus is in grade two now and he leaves for school at 7:00am (usually getting up 10 minutes before it’s time to leave) and comes home for lunch from 11:30-1:30 and then back to school until 4:30pm. It is a long day! Trying to get any homework in at the end of that day is nearly impossible. And he does get homework as well as exams every quarter! 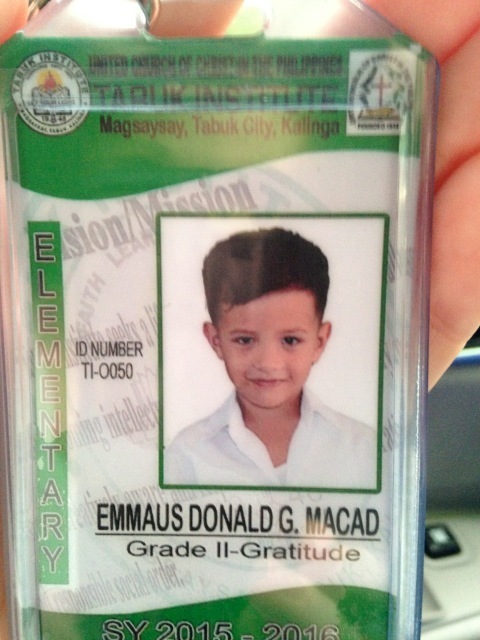 Emmaus is one of the few English-speaking kids in his class so he has been learning lots of Ilokano from his friends. Emmaus also has a Tagalog class and he needs to know Butbut to speak to his grandparents. Lucas is in Kindergarten and so has it a bit easier – for now! Emmaus school ID which MUST be worn every day. I know for a lot of families in my home country of Canada, family time is spent on ball fields, hockey rinks, soccer fields etc. For us, that isn’t really an option as there aren’t any organized sports teams for kids. I am sure some of you moms and dads think that sounds like heaven! 🙂 Our family pretty much spends all of our time together as work and regular life seem to happen simultaneously. If I need to go into the clinic, I will take some of the kids with me and they will play with some of the other kids who came with their moms. If Achao needs to go in search of supplies for a building project, he will pack the kids in the multicab and head out to look for it. Ok I have to say it – Vacations in the Philippines are awesome. We only need to drive for 4-5 hours before we reach an amazing beach with white sands and clear blue water. Who wants to visit? This has been the area of our lives that Achao and I have probably had the most “discussions” about. For the Kalinga culture it is seen as an honor to host guests so when we were first married we had a constant stream of visitors coming to “honor” us by letting us cook, clean and host them for days at a time. In the past few years it has slowed down; I probably offended someone by asking how long they were planning on staying or something. But now it is pretty much just close family members who show up unannounced, planning to stay indefinitely. This I don’t mind at all as it means that Achao’s dad comes often and stays with us. He is a genuine pleasure and we have told him that he can live with us forever. 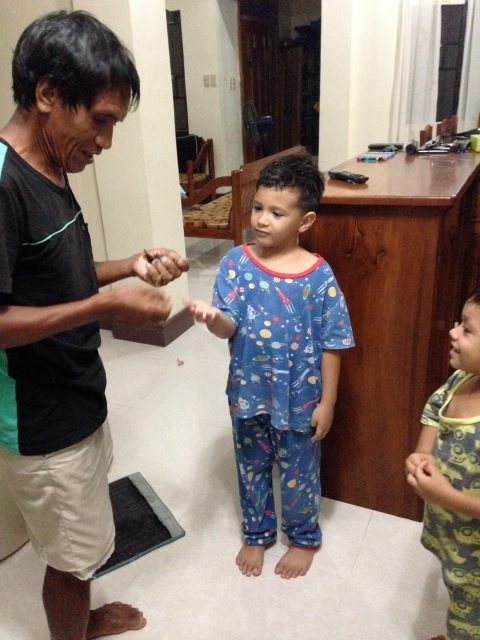 The day that Apu Awoy caught a small bird and tied its foot for the boys to place with … Mom untied it pretty quickly.